KeepTaxisAlive.Org - Why most WAV taxi drivers in Chicago don't know how to safely buckle up the wheelchair user? 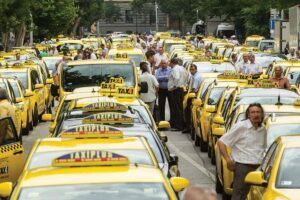 Home › Forums › Taxi Drivers By City Worldwide › Chicago Taxi Drivers › Chicago’s WAV Taxi Drivers › Why most WAV taxi drivers in Chicago don’t know how to safely buckle up the wheelchair user? This topic contains 0 replies, has 1 voice, and was last updated by KeepTaxisAlive.Org 4 months, 2 weeks ago. I’ve noticed many WAV drivers don’t know nor do they care to learn how to safely buckle up a wheelchair passenger. I’m not talking about tying down the wheelchair through the 4 tie-downs in the car’s floors. What I mean is using an actual seat belt to safely secure the passenger who’s riding a wheelchair or a scooter. I know most of wheelchair users don’t care for the safety belt. But there are those who do care. Unfortunately those passengers are usually unable to travel to their destinations because most WAV drivers aren’t willing to learn how buckle up those passengers properly. All WAV drivers should learn how to use the safety belt on wheelchair passengers and it should be part of the driver’s certification program that is giving by the City of Chicago. Securing you disabled passengers is a must because it’s the law and it’s the right thing to do, not to mention the liability you’ll face if God forbids you get in an accident while transporting an unbuckled up wheelchair passenger.